Customization of almost anything, from pens, shirts, and even edible items such as pizza, has increased in popularity around the world in just a short period of time. This is why a number of so-called artisan pizza places have sprouted left and right in the US. However, when it comes to the original and the best casual pizzeria, there are only two that come to mind: Project Pie and Pieology. Now, assuming that you are stuck on a Friday night with nothing to do or nowhere to go and you want to do something exciting because you don’t want to be the only lonely person left indoors, which “design your own pizza” restaurant will you choose? And, assuming that you have already picked your place and made your decision, do you think it will let you sleep peacefully at night? Kidding aside, choosing which pizzeria to pick can be a daunting task, especially when you both adore these quirky places but, sometimes you have to live in a world where black is black and white is white. To make it easier for you, here is a list of few things to remember to help make up your mind. Well, James Markham actually DID think of this concept before because when he built Project Pie in 2012, he had already launched MOD Pizza in Utah and Pieology in California. Markham believes that although all three have basically similar concepts, he considers Project Pie as the culmination of all his work put together. He believes this is his best one yet as it is a product of all the success, failures and what ifs he had encounter with MOD and Pieology. It starts with an 11-inch thin crust that will be made and pressed on the spot. Then, your choice of pizza sauce, whether Project Pie’s signature red sauce or an olive oil variant, will be spread on the crust before you move on to add the toppings you desire. All 30 pizza toppings are made from high quality and fresh ingredients, making your very own “project pie” healthy and guilt-free. 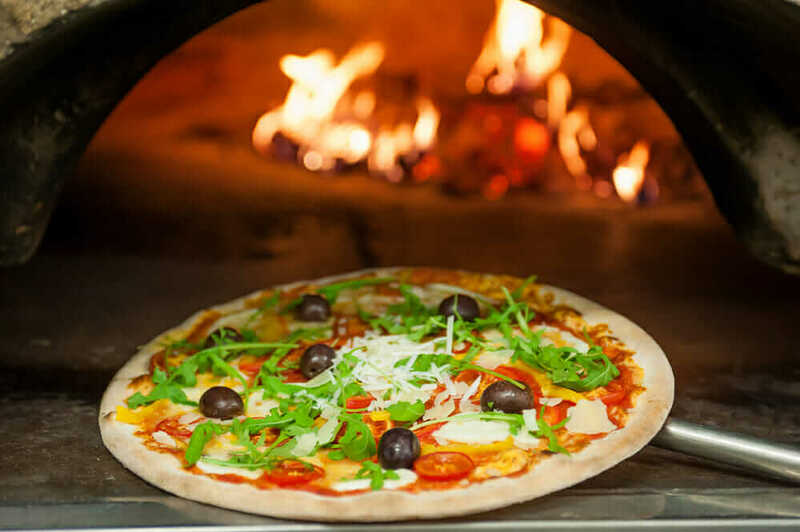 Best of all, as Project Pie is using 600 degrees Fahrenheit in its wooden, stone oven, your pizza will be ready to eat in less than three minutes, even faster than cooking instant noodles or microwave dinners! Feeling a little lazy, then Project Pie also offers “order by number” where customers can feast on ready-made combinations such as #1 Classic Cheese Pizza or #8 Roasted Brussel sprouts, prosciutto, red onion, mozzarella, parmesan on olive oil sauce. Established by the same owner who founded MOD Pizza and Project Pie, the concept of Pieology is to create pizzas that are reflective of the personality of the one who will eat them. It is a unique approach to practicing freedom to choose and versatility between food creation and selection. Hand-crafted and made from fresh ingredients, this pizzeria was made to gather family and friends together and have a splendid time. While it seems that there is no difference between eating at Project Pie and Pieology, then you are dead wrong. The secret lies in the sauce as Pieology offers about seven different sauces that you can add on your pizza. Choose from their signature House Red, 3-Cheese Alfredo, BBQ, Herb Butter, Olive Oil, Pesto, and Fiery Buffalo to help put life in the pizzaz that you are about to make. Once you are done picking the best sauce, you can add your choice of cheese and meat, from mozzarella to gorgonzola, and pepperoni to an all-natural bacon topping. Finish off your creation by adding any of the 16 toppings like roasted red peppers, artichokes, and even corn. If you don’t want to bother with the tedious work of picking what to put on your pizza, then allow the array of “Pieologist’s Favorites” entice you on what to munch on next. You can have the “Mad to Meat You” creation that highlights chicken and BBQ sauce, with a whooping 940 calories to boot. If you want something light, try Pieology’s “Easy Cheesy” which only has 780 calories per 11-inch pie. This comparison is very tricky because James Markham owns both Project Pie and Pieology, although the latter was established earlier than the former. While they offer the same concept, Pieology has definitely exceeded in terms of sauce and toppings available. Furthermore, Pieology was able to provide the number of calories in its pizza creations, something that the younger Project Pie lacks. If these are the basis of comparison, then truth be told, I would choose Pieology over Project Pie in a heartbeat.